Imagine that you’re an alien who is riding along in your spaceship in-transit to your new home on some obscure planet. 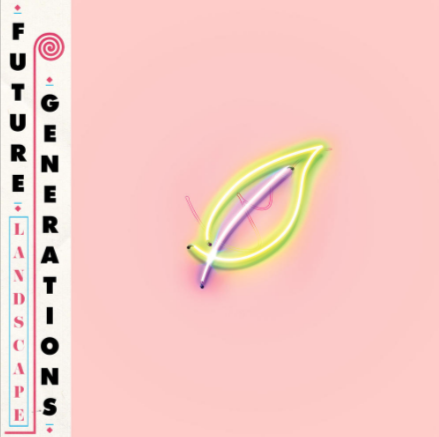 You’re flicking through intergalactic radio and you finally find something that you can vibe with — there’s no doubt that the sounds that you’re hearing bursting from your spaceship is Landscape, the new album by New York-based band Future Generations. Landscape not only captures the thrill of finding solace in new surroundings but also what happens when the past remains etched in your memories. The album opens up on a buoyant note with ‘Stranger’. The track presents the backdrop for the rest of the album — which is somewhere in-between new-wave futuristic pop and indie rock. The track’s opening line “this place is getting stranger”, which becomes a recurring motif during its duration, evokes a sense of displacement in an unfamiliar world. The majority of ‘Stranger’ would be perfect for a futuristic dance party. The last fifty-seconds of the track sounds like what it would be like to be caught in a time machine, with the vocals halting into the background and trickling-like textured percussion taking hold of the rest of the track. ‘Landscape’ appears chaotic and frantic through the use of stuttering percussion and buzzing synths. The track's most poignant words are “The plant’s been seeded now”, which conjure up feelings of acceptance of the past and willingness to move on. ‘All The Same’ stars the beaming sounds of synth-pop, but with powerful words such as “Don’t ever come back, while my heart’s still intact, I’ll hide ‘till you find me”. Along with the upbeat synth-driven sounds that shine across the album, Landscape also features moments of pure euphoria. ‘Suddenly’ sounds like what it would be like to be caught in the daze of a daydream. The track’s fanciful lyrics encourage you to embrace the moment, “I don’t know you, and you don’t know me, but here we both are, so suddenly”. This hazy energy is also evident on ‘Caught Me By Surprise’. The track appears dreamy and atmospheric but features a pulse-like sound throughout the verses, which consequently adds a thrilling dose of elation. Both these tracks perfectly capture the feeling of becoming lost in the moment and finding peace in the present. Another theme that remains prevalent on Landscape is the sense of longing. ‘Hurry Home’, which appears towards the end of the LP, features lyrics such as “I’ve been dreaming of your face all night” and “Oh your touch is all I think about when I am all alone”. These heartfelt words are paired with passionate instrumentals, such as a driving piano, fuzzy synths and punchy percussion. Unlike the album’s opener, which was beaming with energy, The album’s closer ‘Incomplete’ is much more mellow and introspective. Whereas much of Landscape is spent in a whimsical world of thrilling chaos, ‘Incomplete’ sounds like the feeling when reality finally hits you. The lyrics are exceptionally beautiful, and hint at an emotional journey that’s involved a quest towards self-fulfilment — “You won’t believe how long I’ve been searching”. This hit of reality at the end of the album is a reminder that after the flashing lights and thrill of new surroundings, you’re left with an array of memories both of past and present. Landscape proves that amidst the exhilaration of an adventure are raw and poignant feelings of self-contemplation and reflection. If you're in North America, you can catch Future Generations live this September and October. Click here to find out where.